Established in 1968 and experiencing 50 years in companionship with Vietnamese agricultural development, Vinaseed has grown its "seeds" to be "big trees," contributing to continuous improvement of living standards, technical skills and incomes for Vietnamese farmers. Having set the goal to provide high quality seeds with high productivity and wide adaptation to the ecological zones, Vinaseed has focused on researching, applying and transferring technology into agricultural production, technological innovation and industrializing the seed industry. Since equitisation (Stock code: NSC), Vinaseed has considered science and technology as an important driver of the enterprise’s development, gathering resources for R&D investment valued over 300 billion VND. That decision opened up a brighter and more energetic future. 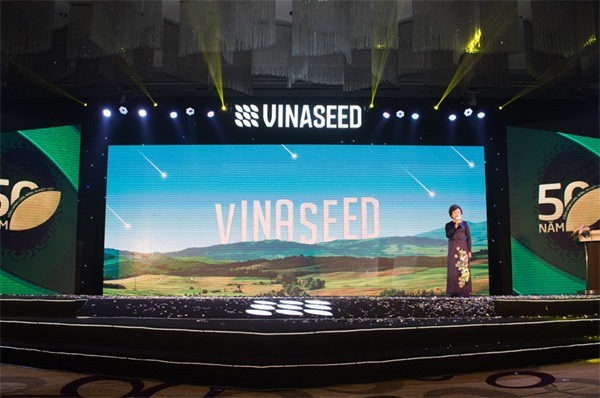 Vinaseed has gradually become a rising star in Vietnam’s seed sector when being the first company in the country recognized as a scientific and technological enterprise. Starting from a company trading common rice seeds, Vinaseed annually produced and traded 80,000 tonnes of seeds, 80 per cent of which is copyrighted products, equivalent to two million hectares of cultivation, 20 per cent of the whole national market. The company has researched, selected and successfully transferred 45 types of seeds, and they have four varieties among the top ten most common rice seeds in Vietnam. After 15 years of equitisation and three years after having officially become a member of The PAN Group, Vinaseed has taken a leap forward with several achievements to become the largest company of the Vietnamese seed industry as of Dec 31, 2017. Specifically, its revenue was 1,512 billion VND, of which scientific and technological products made up 1,200 billion VND; profit after tax was 235 billion VND, meeting the obligations to national budget and owner’s equity was 1,060 billion VND, meaning the average pace of growth in the period of 2011-2017 was maintained at 40 per cent per year. Vinaseed has a nationwide network with 29 members, 1,200 first agencies, 1,000 labourers, 80 per cent of which have postgraduate qualifications. Those figures mentioned above obviously proved Vinaseed’s growth after passing 50 years. Vinaseed has not only spread its new technology to production and businesses while transferring new advances to nationwide farmers, but has also contributed to society and to the improvement of farmers’ lives via its passion, desire and action. Through technological transfer and co-operative production all over Vietnam, many places along with Vinaseed’s help become "technological villages," improving thousands of lives of Vietnamese farmers. Vinaseed’s Industrial Centre project of seed and agricultural processing at Thap Muoi Village, Dong Thap Province, is expected to be the largest in scale and the most modern centre for seeds and agricultural product preservation in Vietnam. Its scale will be 5.2 hectares and its processing and preservation capacity will be 30,000 tonnes of seeds and 100,000 tonnes of rice per year. Total investment will be 216-230 billion dong. The project will come into operation in 2020, becoming a model for the Mekong Delta region and transferring farmers into the company’s value chain in order to build a large-scale region producing high-quality seeds and first-rate rice. 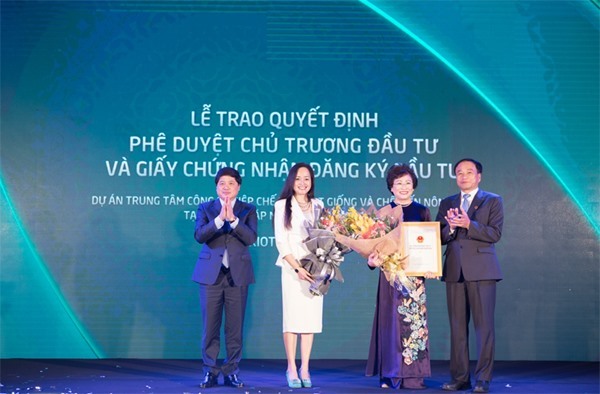 At its 50-year anniversary ceremony, Chairman and General Director of Vinaseed, Mrs. Tran Kim Lien, officially announced the company’s name change to “Vietnam National Seed Group” or Vinaseed Group, and launched its new Corporate Identity Program (CIP). This has marked a milestone for the company in the journey to its strategic vision to become the leading Vietnamese corporation providing sustainable agricultural development solutions towards the international market. Photo 3: Vinaseed officially changed its name to "Vietnam Seed Corporation" and launched a new corporate identity. The logo of Vinaseed’s new CIP shows three seeds like a young sprout transferring to the new symbol of nine gold seeds, implying Vinaseed’s traditional inheritance, scale enhancement and perpetuation. The new square-shaped of nine seeds in logo represents Mother Earth – the source of all living beings – and reminds us of Vietnam’s traditional “Banh Chung" cake. The green color is related to maturity, solidity and reliance while the logo has a brown color related to nourishment and protection developed from the holding company’s brand - The PAN Group. All those traits make the new logo totally suitable for Vietnamese agriculture. 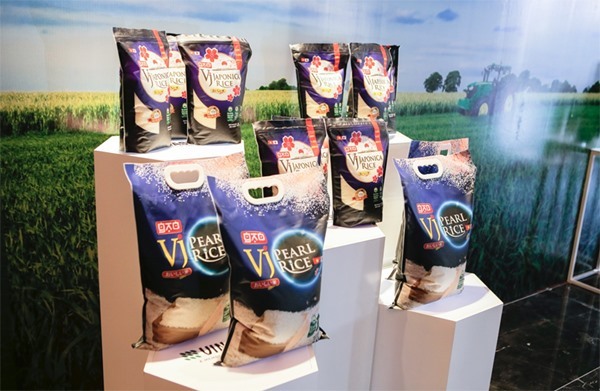 Its strategies closely cohere with the whole value chain of PAN group: “Farm – Food – Family.” Vinaseed has set the goal of dominating Vietnam’s plant seed sector and sustaining its average pace of growth at 20-25 per cent per year until 2021. “Though there will be a lot of challenges in our upcoming journey, we believe that intelligence and scientific competence, strength from solidarity, discipline and aspiration to devote the best seed products to Vietnam’s agriculture will keep on contributing to the improvement of communities’ quality of life,” said Vinaseed’s Chairman. Established in 1998, The PAN Group is the leading company in Agriculture and Food industries with total assets of VND 7,600 billion by the end of QII.2018. Its members include leading companies in agriculture and food sectors, namely Vinaseed, PAN-SALADBOWL, Fimex, Bibica, Lafooco, AquatexBentre, 584 Nha Trang Seaproduct. The PAN Group’s major shareholders include NDH Invest, SSI, CSC Vietnam, The Asian Entrepreneur Legacy (TAEL) Parners, GIC, PYN and latest Sojitz. With a commitment to creating sustainable values on behalf of farmers, families and society by offering the markets with trusted and innovative agriculture and food products, PAN has achieved a robust revenue CAGR of nearly 80 per cent over the past five years. The Company expects to continue to expand significantly in the next few years.